UPDATE: I have the appointment for tomorrow at 3:15 NY time.!!!!! Yeiiii !!!!! !my very first Napro appointment in over 2 years in person (other than one via phone that was 30 minutes after my miscarriage almost 1 year ago). Since we do not have Napro doctors in Mexico yet (3 will graduate this April finally) this is a very, very big deal for me. I am very excited!!!! I am in NYC this week. A business trip which I accepted since its a long weekend in Mexico and my DH and my parents could be with Josemaria all of the time. I just spoke and saw them via Skype and I just can see how happy my parents are to have him for a few days with them. He is so far the only grandson nearby and they are so so happy. They have been preparing for weeks now for his arrival and could not be more excited. Its really a blessing to have such a family. My DH is staying with them also so I will most probably will have 2 very spoiled men in my life once I come back. Today I was beat after arriving last night and having immigration issues due to an airline mistake (I will blog about it later). I basically slept only 4 hours . I really was thinking about going late in the day to Mass, but something inside of me told me that I needed to go to Mass at St. Patricks and I looked for the most important one which was 10 a.m Mass and decided to go. It was so worth it! I attended Mass presided by Cardinal Dol.an himself with an amazing choir and a couple of hours after praying in St Patrick for clarity I think I found it. I had been to NYC before I guess 3 other times, but somehow it had lost all its appeal to me since I started my Napro journey. I saw it as a place which signified the worst of the culture of death. After learning that 40% of all pregnancies here end in abortion and knowing several people from Mexico that had IVF here (I know of at least 5 cases close to me that had done it in NCY: one has twins after almost dying, one has 2 sets of twins and the rest are failed IVF`s, cases you never hear from people) I really could not shake this feeling. So I decided to start with Mass and see the other side of the city which I knew existed and it simply was amazing. The USA is very blessed to have Cardinal Dolan. While it has a president that not only is promoting abortion in the USA but in the rest of the world (investments in abortion, forced sterilization in poor countries, etc) on the other side has this amazing Cardinal. God is very wise, he would not leave his sheep lost before the wolf without a strong sheperd. Well he started making jokes about his pink vestments today and then began speaking about joy. One thing that really struck with me is how much he emphasized the difference between joy and pleasure, one is deep, one is shallow and that Mother Theresa of Calcuta had said: Joy is: Jesus first, then the Others, then You. I really loved it. After Mass and completely unexpectedly he went right to the back and then came back again on one side. I was able to see him less than 3 feet from me and I took a couple of pictures. I was very, very happy since I admire his strenght agains the HHS mandate so much. Then I visited again the side of St. Patricks where the Virgin of Guadalupe is. On one side was St. Patrick and on the other was Her. I was so amazed. She was filled with flowers (tons and tons) and many people were praying to Her. I asked Her to interceed for all bloggers, those still waiting, those pregnant and those already mothers . I lit a candle for all of you . I also prayed again to Her so we could be parents one more time . I had asked Her in my last visit a few years ago and now again. And this time I also asked for clarity on next steps. 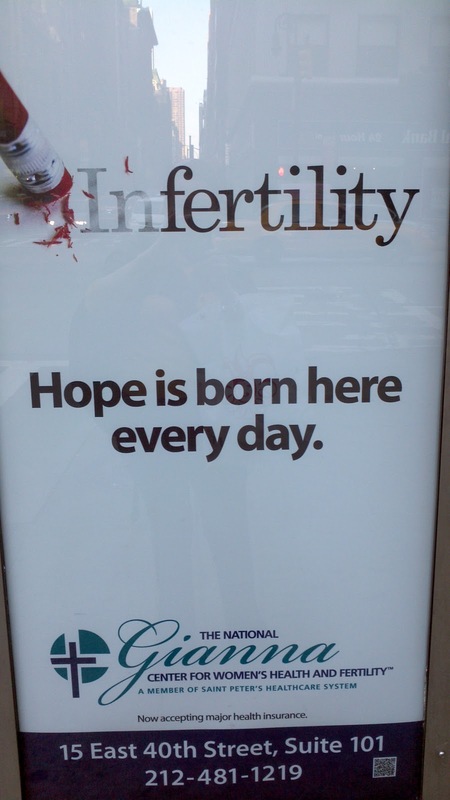 Afterwards I went walking down 5th avenue and I do not remember if it was on a side street of it or later on 6th avenue, but as I stopped in front of a stoplight I saw an ad at a bus stop and the word infertility with the IN about to be erased . 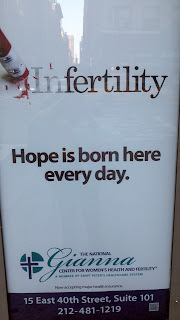 The very first thought that came to my mind was: Another IVF clinic, but NO!!! As I looked closer to it said Gianna center!!! I. Advertising for Napro right in Manhattan´s top streets. Here is a picture of the ad. I am super super excited to see marketing for Napro as a marketing person, as a woman facing IF, as a practitioner. I really cannot believe I saw this in a city such as NY. What are the odds?????????? This and Cardinal Dolan gave me so much hope!!!. I have long admired this center and would love to model what we are trying to do in Mexico after it . A Catholic health center in a major city. I had already spoke to the doctor there when we started working to bring Napro to Mexico and she was the nicest doctor ever. And St. Gianna as I have blogged is very, very near my heart as I was married on her feast day and Josemaria was born on the very same day she gave birth. Amazing God incidences. And not only that: right now in my room beside me is her biography which just arrived via A.mazon. Somehow seeing this ad, looking at the book in my room and specially after praying specifically for a sign made me decide to restart my crazy napro adventures and what better place than the Gianna center. I really need to put in order my ideas on what to do next and I know that the center and Omaha are very connected so this could be God sent. After my miscarriage I stopped doing anything crazy and only did very basic Napro. I stopped all my crazy adventures: Doing testing on my own, travelling to Omaha without insurance, studying to become a practitioner before even having had a single intro session in my life, etc etc. But time is short for this 40 year old woman and I really need to feel the peace that I did everything in my power to have another baby. But I am here in NY and the Gianna center appeared right after I prayed for guidance. A center called Gianna, such an important saint for me. Sometimes God needs to hit me on the head. Call me crazy, but guess who will try to have an appointment with them this week????? and guess what? Peak Plus 7 is right around the corner!!! I could maybe retake again all my blood tests of P+7 and ship them to Omaha. Something that I could never ever do from Mexico. I will try to do it tomorrow early. Praying it all works on St Josephs day. Can you please pray for me? Lady of Guadalupe please help. Praying for your safe travels & Good Luck with the appointment. God definitely has His hand in all of your NYC adventures! I really hope that you get to have an appointment at the Gianna Centre! I wanted to say... when I was young (I forget how old, but somewhere around 10?) my Mom brought me to St Patrick's for Mass and a visit... I remember so vividly that statue of Our Lady of Guadalupe... BECAUSE, it was THE FIRST TIME I was ever introduced to her! I'm sure I'd seen pictures, etc. but never really *knew* her before this visit to St Patrick's Cathedral. And when you're done at the Gianna Center in NY, come visit me at the Gianna Center NJ! I love, love reading about your God-incidents. May God bless you and keep you safe on your journey. Girl, you'd better believe I'll pray! =) I agree with you... Both Cardinal Dolan and the Gianna Center give the gift of HOPE at a time and in a place where it is needed most! Oh... I also wanted to tell you that the doctor who was in the O.R. w/ Dr. Hilgers this past Friday was from Mexico! How AWESOME is that?! I was reminded of you and of all that has been happening in Mexico. Good luck getting that appointment and may all your travels bring you safely home! Praying that all went well with your appointment - can't wait to hear the update!! Praying for you! I saw the same Gianna Center ad driving in NJ and let out a great big woop of joy! Praying everything goes well and that you have peace. That ad brings tears to my eyes!! Hope your appointment went well! I am thrilled about the advertising and the God-incidences. I'm catching up on reading, so I hope and pray that all went well. Next time you're in NYC - email me and we can meet! Oh - and in the Bronx - 60% of pregnancies end in abortion. So terrible. It's the abortion capital of the world.